Posted in: General. Tagged: Adam and Eve, Adam's Rib, Arch, architecture, Mammalian Matrix, mitochondrial DNA, Oxidative phosphorylation, Respiration, rib, The Bible, Tsela. The traditional version of the story is accurate to the text except for one important detail. The original Genesis story does not necessarily mention a rib. The Hebrew word for the body part that God takes from Adam is tsela. But this word never means “rib” anywhere else in the Bible. Mitochondria, is the ribbon of respiration in other times mentioned as :atman or atmen. 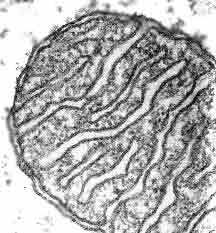 What else could it be than the mitochondrion and the mtDNA, it is the central part of respiration and the power plant of energy. The mtDNA is maternally inherited some it comes from eve. And the word Adam means earth or earth dust – Adama. If you have a cup of sand and put it out to build a little castle of sand, the sand is not in the cup, right? If Eve was made from Adam’s “tsela” Adam don’t have that “tsela” of his own. כא וַיַּפֵּל יְהוָה אֱלֹהִים תַּרְדֵּמָה עַל-הָאָדָם, וַיִּישָׁן; וַיִּקַּח, אַחַת מִצַּלְעֹתָיו, וַיִּסְגֹּר בָּשָׂר, תַּחְתֶּנָּה. 21 And the LORD God caused a deep sleep to fall upon the man, and he slept; and He took one of his ribs, and closed up the place with flesh instead thereof. כב וַיִּבֶן יְהוָה אֱלֹהִים אֶת-הַצֵּלָע אֲשֶׁר-לָקַח מִן-הָאָדָם, לְאִשָּׁה; וַיְבִאֶהָ, אֶל-הָאָדָם. 22 And the rib, which the LORD God had taken from the man, made He a woman, and brought her unto the man. This is what keeps every cell in the body breathing, the very fundamentals of life. Not only is a rib protecting the respiration but also the very arch-itecture of human respiration and power-plant Matrix of the mitochondria which is maternally inherited. Bereshit (בְּרֵאשִׁית, literally “In the beginning” was only women, and the great souls comes from the earth dust. Adam could also mean dust or earthdust – adama.